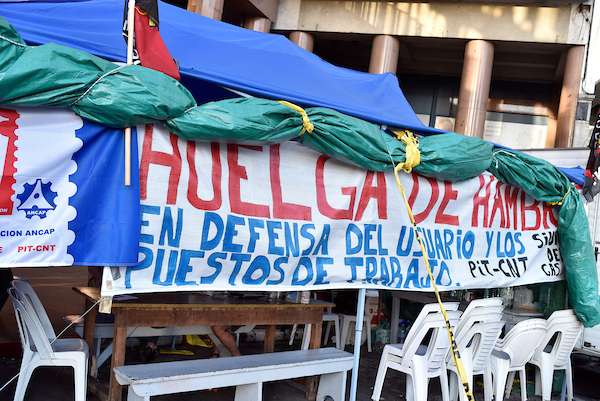 The Uruguayan comrades from the UAOEGAS union who went on a hunger strike for almost a month have signed an agreement with the country’s executive power and the MontevideoGAS company (Petrobras). After an extensive conflict, there was finally an agreement between the three parties and the company undertook to reinstate the laid-off workers. As a result of the progress achieved, the workers ended the hunger strike and other fighting measures. In this sense, a new space for negotiation has been created in the Ministry of Labor, which is expected to be fully operational until the end of the year. A dialogue space in the Ministry of Industry will also be set in order to analyze the future of gas service in the country. To read the full communiqué in Spanish, click here.